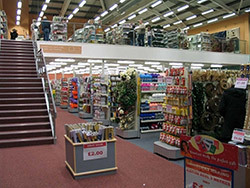 Hamshire Mezzanine Floors is a leading specialist in the installation of mezzanine floors for a range of commercial premises. We provide a fully inclusive mezzanine floor fitting service for a range of commercial properties including offices, retail spaces, factories and plants as well as storage spaces. We support our clients in achieving the best use of space within their commercial property at reasonable and cost-effective prices. 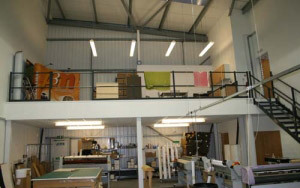 A mezzanine floor is a great alternative option to premises extension or relocation. Mezzanine floors are an intermediate level or floor between main floors in a building. They are most commonly found in business premises such as offices, warehouses and retail spaces. They provide the perfect solution to creating more space by maximising the use of your current space. The height of the floor will depend entirely on your commercial space. 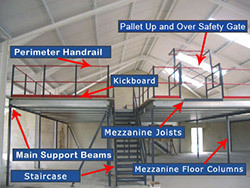 A mezzanine floor can be installed quickly and simply. All of the fabrication work occurs away from your business premises. The floor is delivered and assembled by our professional team of experts. Many HMF clients have worked with us to create individual office spaces, staff break-out areas, meeting rooms as well as additional storage areas as their business grows. Rather than building an extension on-premises or moving to an entirely new location, installation of a mezzanine floor is a far more cost-effective option for developing and growing businesses. The majority of the mezzanine floors fitted by HMF are free-standing structures that are not fixed to the fabric of the building. However, we can arrange for this where necessary. We design mezzanine floors for all manner of applications, so whatever your requirement is, we’re sure we can find a solution. The loading of these floors can range from 3.5kN/m² to loads in excess of 9.6kN/m² and are designed by us to suit your individual business needs. We want you to get the very most out of the space and budget that you have. With varying heights and weight loading, our mezzanine floors are bespoke in design and built to suit your requirements and applications. The HMF service is fully inclusive to provide you with support from the start of the project, to the finish. Working with a wide range of trades enables Hampshire Mezzanine Floors to provide a complete turnkey service for a range of commercial requirements. This aims to save you time and money in sourcing multiple trades for your new fit. What’s more, we’ll project manage your fitting so you’ve got a single point of contact throughout. Making the decision to expand your premises by fitting a mezzanine floor might seem like a daunting task, but at Hampshire Mezzanine Floors we aim to make everything as easy as possible for you. As experienced specialists, we’ll go through each stage of the process with you, ensuring you’re fully clued up and can make the right decision for your business. This includes everything from design, approval, to final installation, allowing you to realise the full potential of your building. 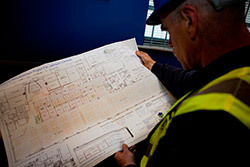 We use only the top quality custom designed floors which complies to current BRE Digest 437 and Building Regulations. Ensuring that all of our installations meet the highest safety standard is our top priority. 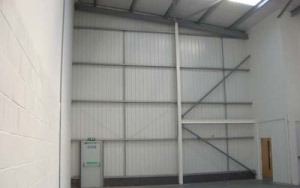 Mezzanine floors, storage platforms and raised floors that are used exclusively for storage can also receive a dispensation from building control bodies for the need to fire rate. This can drastically cut your costs and is a great option if you’re in need of additional storage solutions. However, you should always check with building control as to your needs to fire rate your mezzanine floor. If you are using your mezzanine floor for workstations and offices, or if the general public will have access to it as part of a retail store, you need to ensure you have the right fire protection. The rating requires one hour for each of the elements including the suspended ceiling, fascia protection to any exposed edges of the floor and the column casings. This might sound a little bit complicated, but at HMF we will advise you on exactly what fire protection you’ll need to ensure you satisfy the latest building regulations. What can HMF offer you? For more information about our services or to book a survey please contact us. We’ll be happy to go through everything with you, ensuring you get the right sort of mezzanine floor for your business.